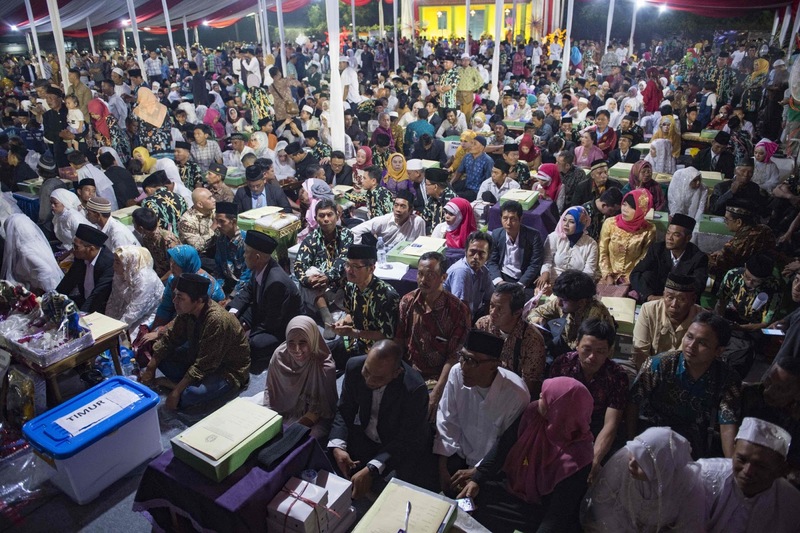 Hundreds of Indonesian couples celebrated New Year’s Eve on Sunday night by tying the knot in a mass wedding in Jakarta. Nearly 450 couples gathered in a large tent in the city center just hours before midnight to pray with their families before signing marriage certificates. Government officials oversaw each brief ceremony. “We wanted an unforgettable experience and we’re so happy that we decided to participate today,” said Hartiningish, a 38-year-old East Javanese bride, while a live band played a set of traditional and pop music in the background. Her husband, Ricky Rangga, 30, said the couple was grateful to the city administration for making the wedding possible. Many couples wore matching colors and colorful traditional Indonesian outfits, with some brides donning elaborate headdresses and grooms carrying traditional daggers called keris. Jakarta Gov. Anies Baswedan congratulated those taking the plunge and said the city would now host the event every New Year’s Eve. The city government raised donation funds to pay for token gold dowries for the couples to exchange. Grooms in Indonesia traditionally present gold jewelry or money to brides on the wedding day. “We’re planning to do this every year,” Baswedan said, after posing for photographs with some couples. Security was tight around the event’s venue in the heart of the city, which took place just a few meters from the site of a militant attack in January 2016, when Islamic State-linked radicals killed four people using guns and bombs. Tens of thousands of police and military personnel have been deployed in Jakarta and across the country to safeguard holiday celebrations as the country remains on high alert. One young pair from west Jakarta said they were looking forward to their honeymoon in the holiday island of Bali, where an active volcano, Mount Agung, remains on alert status for an imminent eruption. “If we’re together, there’s no need to be afraid of (the volcano), we will just enjoy,” Ruri Nurhayati, 22, said, just minutes after marrying her partner Andrianus, who goes by one name.